Joachim Löw and his Germany side were held to a 2-2 draw by Ghana on Saturday evening, leaving Group G qualification firmly in the balance. After a heartbreaking loss to USA in their opening game, the Ghanaians started the game in timid fashion, wary that an early goal could cost them dearly. They had the first chance of the game though, a low cross was met by Gyan, who could only divert the ball over the bar from close range. A couple of swift attacks but the game firmly back in the German’s grasp, Özil and Kroos both denied in quick succession by the stern Ghanaians. Löw’s side continued to attack, but couldn’t force the openings that they managed against Portugal last week. Appiah’s side weren’t here to make up numbers though, and Neuer was finally called into action when Muntari unleashed a 25 yard drive shortly before the half hour mark. They continued to press going into the break, and as both sides went into the break locked at 0-0, it will no doubt have been the Africans that would be the happier of the two teams. The Europeans switched things up at half-time, Boeteng made way for Mustafi as Löw tried to inject something into the game. The deadlock was finally broken five minutes after the interval, when a fabulous ball in from Muller reached Mario Götze, who beat the ‘keeper in unorthodox fashion, by heading off his own knee into the net. Ghana were not fazed by the goal though, and the perfect response came just four minutes mate, when another pin-point cross reached Andre Ayew, whose header left Neuer stranded as the Africans levelled proceedings. That opened the game up, and it was obvious both sides sensed more goals, though few would’ve predicted that Ghana would’ve retaken the lead. That is exactly what happened though, a quick break saw Asamoah Gyan make space in the box, and he crashed an effort into the corner to send the African contingent into raptures. No-one could write the Germans off though, and the introduction of Schweinsteiger and Klose certainly spiced things up. It took just two minutes for that to pay off, Miroslav Klose reacting first to a corner, poking the ball home within the six yard box, to level the game, and put him level with Ronaldo on World Cup goals on fifteen. The end-to-end battle continued though, both sides unable to get that vital fifth goal that would be massive to them in the context of the group. The draw was probably the fair result though, but left Ghana theoretically needing a draw between the USA and Portugal to remain in contention to qualify. GERMANY: Neuer, Höwedes, Hummels, Lahm, Mertesacker, Boateng (Mustafi 46), Khedira (Schweinsteiger 70), Özil, Kroos, Götze (Klose 69), Müller. GOALS: Götze 51, Klose 71. GHANA: Dauda, Mensah, Boye, Afful, Boateng (J. Ayew 52), Muntari, Rabiu (Agyemang-Badu 78), Asamoah, Atsu (Mubarak 72), A. Ayew, Gyan. 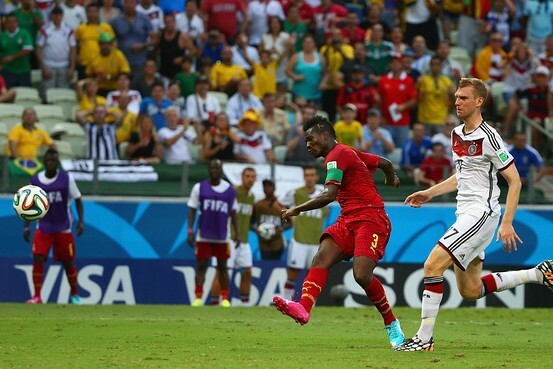 GOALS: A. Ayew 54, Gyan 63.